The LazerLift® uses groundbreaking laser technology, which allows us to tighten and lift the lower face and neck both at the surface, as well as within the underlying connective tissue of the face (the SMAS layer). 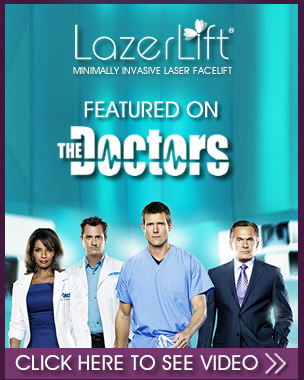 Before LazerLift®, the only way to access and lift the SMAS layer was through invasive surgery. Unfortunately, the SMAS had to be cut, tightened, and sutured, leaving patients at risk. But the LazerLift® works differently. Lasers have long been used for cosmetic purposes but, until recently, lasers were too potent and risky for skin tightening in smaller, more sensitive areas like the lower face and neck. Now, the LazerLift® changes everything. The LazerLift® uses sophisticated, highly advanced Nd:YAG 1440-nm laser energy to provide significant structural SMAS and skin tightening that is both safer and more precise. What’s more, because this revolutionary laser technology can be introduced through microscopic entry points, patients can avoid the scalpel altogether. The LazerLift®’s revolutionary ThermaGuide™ system also provides patients with optimal safety. The ThermaGuide™ delivers real-time, in-tissue temperature feedback to avoid the risk of over heating tissue. If the ThermaGuide™ senses temperatures that are too high, the device will stop the laser from firing until the tissue cools. 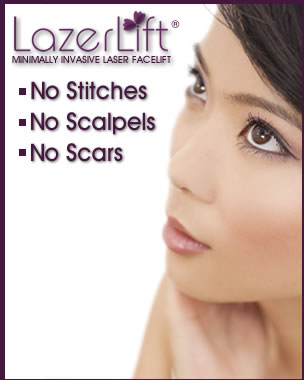 With LazerLift®, there’s no cutting, no stitches, no general anesthesia, and minimal downtime. As we grow older, the image in the mirror may not match the way we feel. When we age, skin becomes lax, leading to sagging, wrinkles, and the loss of youthful contours. The structural support, or SMAS, also loses its elasticity. The LazerLift®’s powerful, precision laser can help combat these changes. During the LazerLift® procedure, targeted laser energy is used to deeply and safely heat the skin and the SMAS layer beneath the surface. The laser energy promotes tissue coagulation, which results in an immediate SMAS and skin tightening effect, as well as continuing improvements in the months following your procedure. The results are amazing and long-lasting! * The LazerLift® can help tighten and lift your lower face and neck, reduce wrinkles and sagging, and give you a more defined jawline as well as elegant, youthful curves in your neck.